This is the story behind my Guinness World Record™ for the Most dominoes toppled in 30 seconds. Toppling dominoes might be a popular thing to do, but I’m not so sure how keen you’d be under the pressure of a stopwatch. I tried my hand at this, knowing my speed at standing up the dominoes and then knocking over the line would be directly affected by many of my own personal attributes. For instance, my hand-eye coordination, peripheral vision, and how quickly my fingers sweat would all impact on the tally I could achieve. 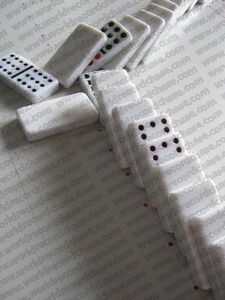 Nevertheless, I borrowed a box of heavy dominoes from a family nearby and got to practising. First I had to stand the dominoes upright within 30 seconds, and then topple them all. Having cleared my office desk for yet another world record attempt, I made sure nobody would disturb me and I flopped into my swivel chair. As always, I’d brought out my timer, and placed it where I could easily see the digital screen. As the timer ticked over to the 30-second mark, my hand lunged forward to pick up the first domino. I’d laid a few dozen out in front of me and my fingers struck the first one with such force, it shot right off the far end of the table. Other dominoes scattered across the surface too. This meant there was no point in continuing because my cycle time had been disrupted – I’d lost a second or so and would not be able to make up for it. I had to start over again. As fast as possible, I positioned domino after domino just millimetres apart, each on end. I had to retry many times because sweat on my fingertips kept sticking to some dominoes but finally I got it right. The snaking line of upright dominoes then lay across the table top before me. It felt good to see what I’d done. But that feeling didn’t last long. The next step in this world record attempt was to strike one domino and watch every other one fall over. With a gentle touch, I set the right hand-most domino off-balance and the rest followed, clicking softly in quick succession as they each touched the one alongside and fell. Very fast, the upright domino snake had become a fallen one. And that’s precisely what I wanted to see: one flick of a domino and the entire line down. Nice. Although not so nice when I began thinking of what I’d caused to happen – with one gentle touch, I had collapsed every one of the standing dominoes. My thoughts ran wild. What if that line of upright dominoes had represented things people need to live, like clean water, unpolluted air, nuclear-free neighbourhoods, pesticide-free farm produce and communities which are acutely aware of their place in nature? What if each domino was a part of an ecosystem, tightly connected to the one next to it, just like coastal fish stocks and estuaries? If I could collapse the lot by simply disturbing one domino, it’s logical that modern societies could knock over a whole lot of ecological systems which we rely on for life unless we look into the mess we’re creating! Wow. What a worrying thought that is. Thank goodness I only did that to dominoes, which I could collect and reassemble just the way I want them. That won’t be possible if we damage the earth’s life-giving systems, though. Anyhow, although I’m concerned about sustainability, I also need to keep attempting world records, and in this case, that meant toppling dominoes. I was happy with my record attempt, and submitted it to the judges. Before long, I heard back – it was positive news. I’d landed myself yet another world record. Awesome! This was theoretically such a simple thing to achieve, yet it took an hour of dedicated practise. What’s more, it happens to be a really good example of how ecological collapse could occur. What a cool world record, wouldn’t you agree?.